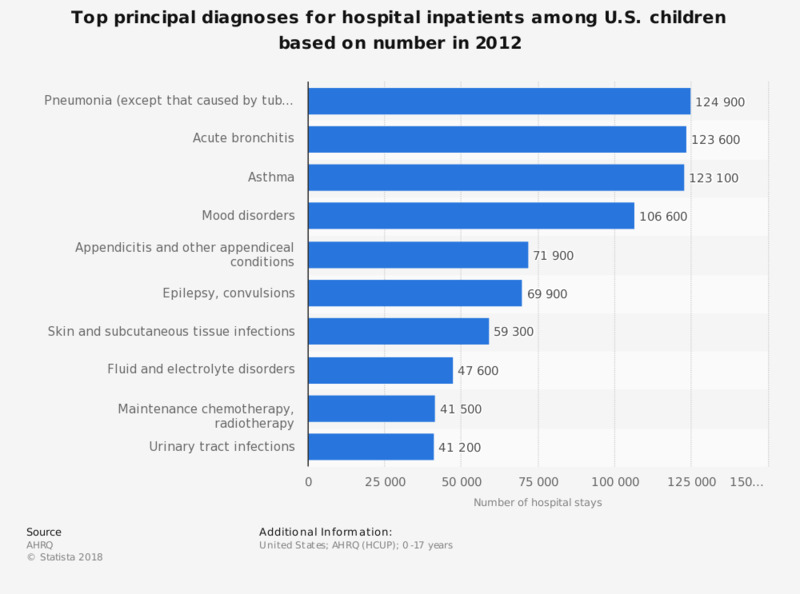 This statistic displays the most common principal diagnoses for nonneonatal and nonmaternal hospital inpatient stays among U.S. children, aged 0 to 17 years, in 2012. During this year, 69,900 hospital stays among children were due to epilepsy or convulsions. Hospitalizations among children seem to have become more common among children with chronic conditions. Majority of hospitalizations among children were infants and newborns. This table is limited to nonmaternal and nonneonatal stays in the child populations. Principal diagnosis is identified using Clinical Classifications Software (CCS) diagnosis categories.